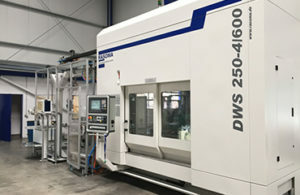 Now available from German Machine Tools of America (GMTA), a full line of Rasoma machining centers, including vertical turning centers, 4-axis shaft turning centers, end machining, double spindle and various special purpose machining centers, such as cross-hole drilling in crankshafts, with full automation is offered. Rasoma is a large machine tool builder, founded in 1919 and based in Döbeln, Germany, who provides contract manufacturing to some of the best known brands in the global auto industry, as well as its own brands. Machines for turning, milling, drilling with the possibility to combine with gear generating processes, are available in a variety of configurations and the GMTA application engineering team can assist interested parties to determine the best solution. Rasoma machining centers offer high rigidity, in particular machine types due to separate X and Z slides, plus the fact that the machine head is designed as a monoblock with polymer concrete fill. Thermal stability is enhanced by cooled motor spindles and the rapid traverse on these centers ranges up to 60m/min at high acceleration, with feed and removal speeds to 120 m/min, less than 6 seconds from part to part and turret indexing typically under 1 second. Full option packages include robotic handling and part articulation, integrated metrology onboard, working inside or outside the work envelope, full tool measurement and monitoring systems and driven tool packages, all controlled by a single Siemens CNC. Many videos of Rasoma machines in action may be seen on YouTube by visiting www.gmtamerica.com.